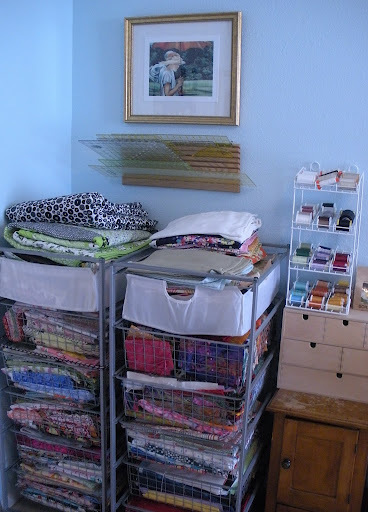 Just a few short years ago, I lived in a teeny tiny apartment with almost no closet space, and my sewing area was set up in a small area at the foot of my bed. It was not a great creative climate, and incidently, I created far less art than I do now. To me, having the space to create is just as important as having the tools to create! The vintage items that line the top of the bookcase just make me smile. The box used to store my Mom’s oil paints and brushes (today it stores small jars of beads), the wood finials are from my Grandpa’s workbench, the mini iron was an antique store find, and the spools and hem marker were gifts from my friend, Toni. Everything I chose to display, store, or hang in this room gives me a sense of joy and peace, either because of who it is/was connected to, the colors/patterns that give it visual appeal, or the what it represents. I don’t know who made this gorgeous crazy quilt of 1950s and 1960s fabrics, but it reminds me a quilts my grandmother made, all types of fabrics mixed together, colors wildly combined that somehow “work”, it’s just a happy quilt. In 1950, my grandma would have been the same age I am today. 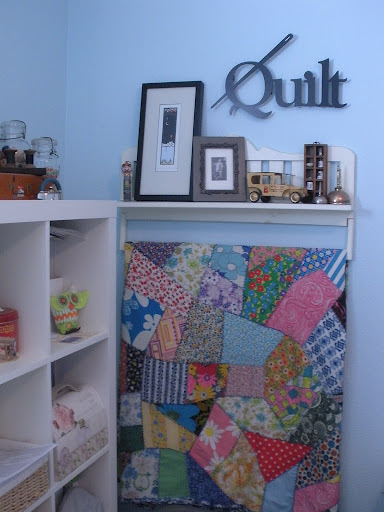 I like to think she might have created something like this quilt when she was just facing her middle age…as I am now. On the shelf is a photo of my Grandma in her rose garden, when she was about ten years old. She’s wearing a fabulous 1920s sailor dress and has a hideous short bobbed haircut–it’s priceless! And, at the right is her thimble collection. And in the corner is my stash, housed in Ikea Antonius baskets…which looks nice and tidy right now, because I just cleaned it out to do some destashing via Etsy. That’s a little tour of my studio, my fabulous aqua blue, filled with joy and happiness, “creative climate”. Hey Doris, You are fabulous! 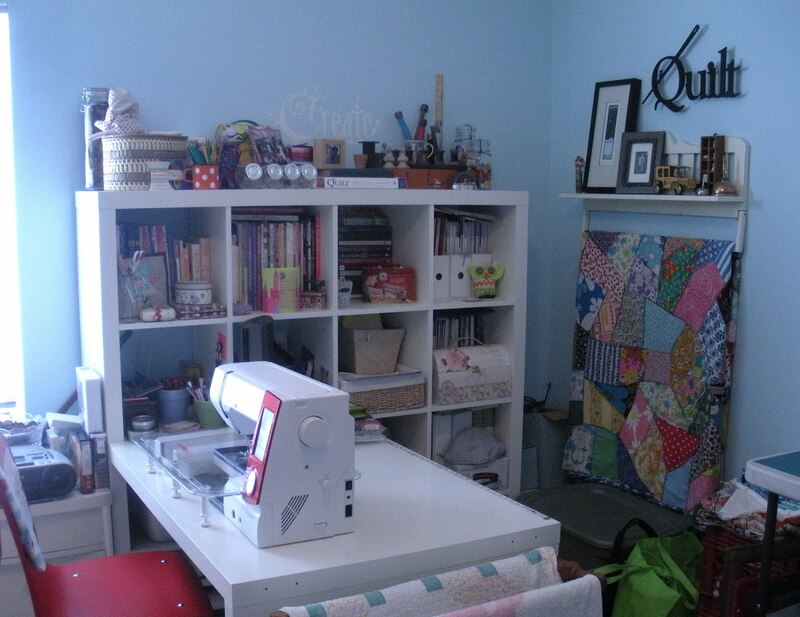 Happy sewing in your happy studio! Have a great weekend, my friend! Nice working space…and SO neat..wanna come to my house and neaten me up…? It not only looks great , I bet it is really comfortable to work there. 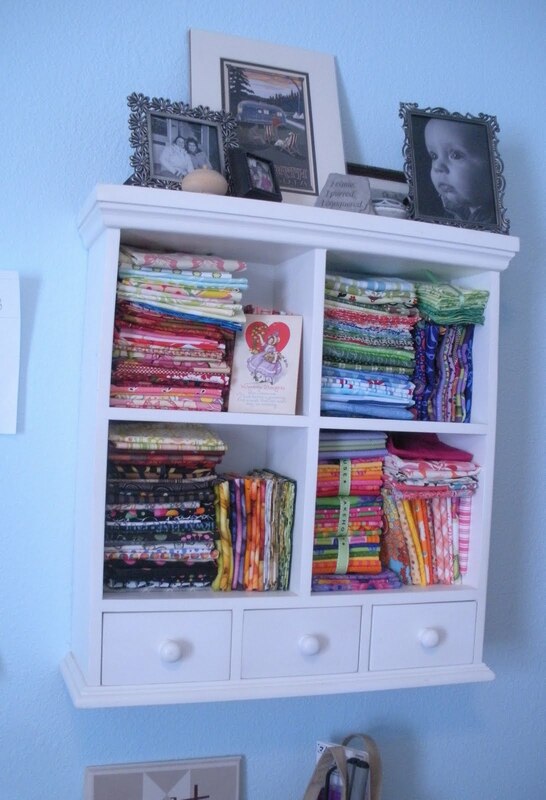 Thanks for sharing..
what a beautiful space to sew in! i need you to help me spruce up my space i think! 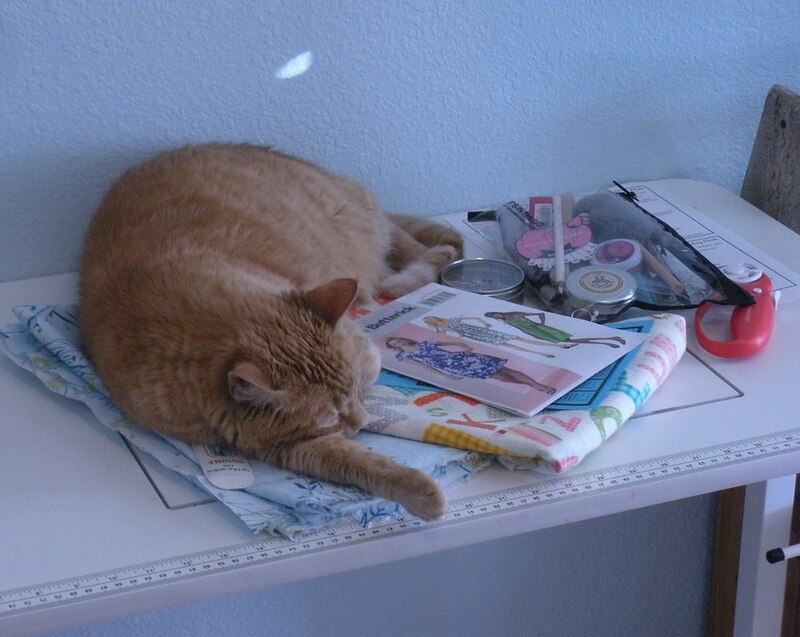 ;0) although for now, i'm in the “i am so grateful to have a designated space to sew” camp. like you said, it does make a huge difference. What a wonderful room! I too painted my sewing room aqua and I want to use splashes of green and cream for a beachy serene feel. 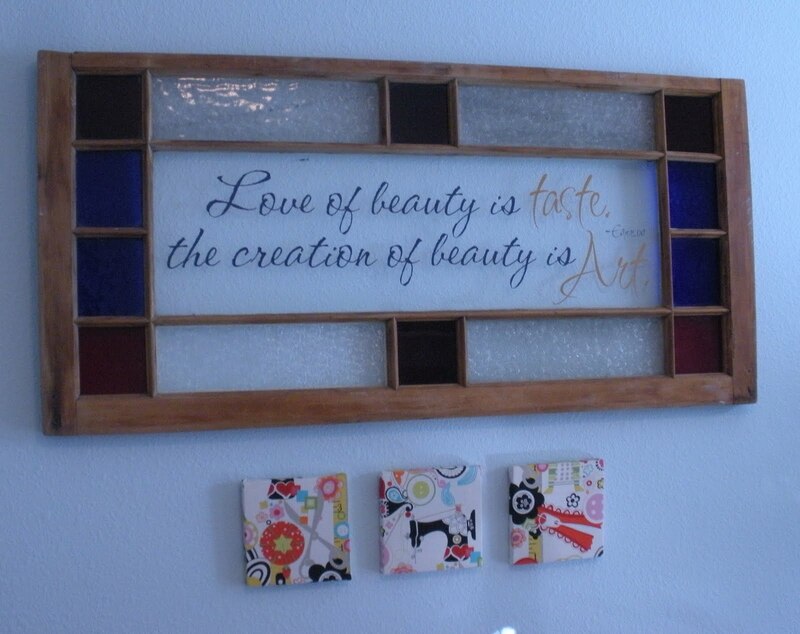 Love your items of the heart…I need me some of those….I want to make my space a haven. thanks for the tour. Very pretty, well-lit, neat and tidy. It looks extremely conducive to creativity. I like it! Love your studio tour (and your studio!!!) Doris! I can see why you created such lovelies in there. More happy sewing to you! Wonderful new studio!! Thanks for the tour. I have the same Ikea set up and love it! Quite roomy for the sewing machine. 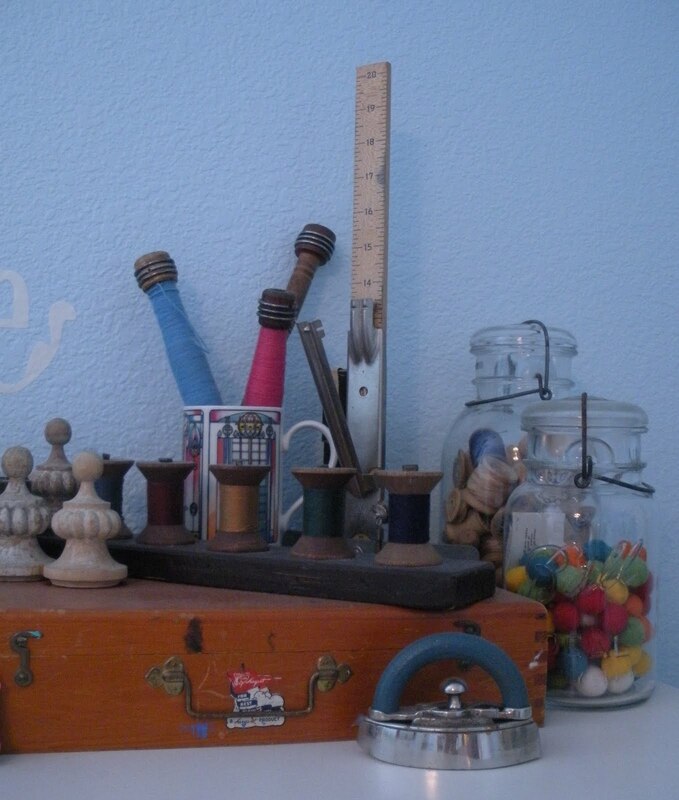 So many of the decorative things in your sewing room are special and personal. That alone brings sunlight and comfort to a room, even on a cloudy day. 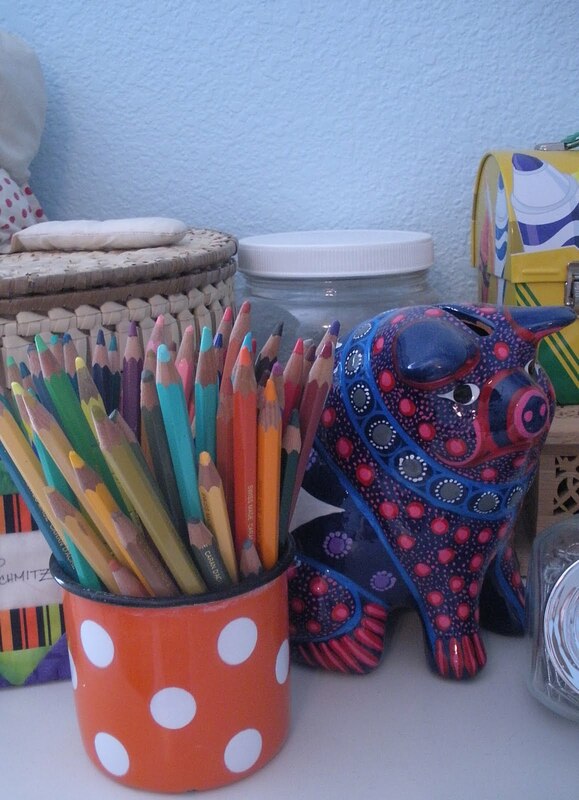 Your room is definitely a place for creative juices to flow. I'm envious of your creative lineage. The most my grandmother could put together were noodles and boiling water. Lovely space! Mine is carved out of the Man Cave that is our basement! It's so lovely . . . I've been taking the studio tour, and it's inspired me to tackle my own and give it a makeover. I started last weekend . . . we'll see what happens. Love your blue walls. What a wonderful space! I could do with something like that, but I guess it is kinda difficult in a one-bedroom flat. But I can dream, rigth?